Price and date from Locus1. 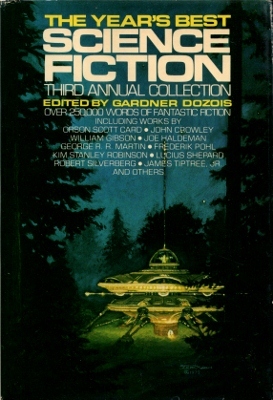 Image of the SFBC edition is the same as the Bluejay TP edition but without the Bluejay logo (logo is on the spine). Gutter Code "Q37" page 625 (?) shows an early Sept. 1986 printing. Verifier1 copy has no gutter code (possibly a later printing? ).PV2's copy has gutter code "R36" cooresponding to a late 1986 printing. Jacket art is shown as by "Tom Kidd" from the back jacket flap and by his signature and copy right mark from 1979 on the front art work. 351 • The Only Neat Thing to Do • [Rift] • (1985) • novella by James Tiptree, Jr.